Indian Navy Recruitment 2018 Apply Online : Indian navy Has recently published the job recruitment sailor for metric (MRm) OCT-2019 Batch from unmarried male candidates 400 posts. 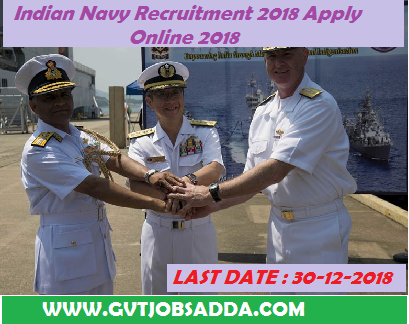 Those candidates who are interested in Indian Navy Recruitment 2018 Apply Online. candidates may check official notification for the Indian Navy Recruitment 2018 & Apply online Before Last date of online apply Indian Navy. Brief information About Indian Navy Recruitment 2018 has Given below. Education Qualification of Indian Navy : Candidate must have passed Matriculation Examination from the Boards of School Education recognized by MHRD, Govt. of India. Payment through online mode by using net banking or by using Visa/ Master/ RuPay Credit/ Debit Card/ UPI. Selection of recruits is based on State wise merit of their performance in Computer-based Examination, subject to qualifying Physical Fitness Test (PFT) and fitness in Medical Examinations. PROMOTION : Promotion prospects exist up to the rank of Master Chief Petty Officer-I, i.e. Level 8 of the Defence Pay Matrix (₹ 47,600- ₹ 1,51,100) plus MSP @ ₹ 5200/- per month plus DA (as applicable). Opportunities for promotion to commissioned officer also exist for those who perform well and qualify the prescribed examinations.